Users with the role ManageTransactions or MissionGiving can record a cash or check payment or change a person’s Balance by using the green Transaction button in the Member Dialog box. Open the dialog by clicking a person’s Member Type for that organization. The video below demonstrates how to add a transaction and how to make a fee adjustment. Use this in order to record manual transactions. You must record the Total Fee , and then enter the Payment . Use this if the cost of the event needs to be increased or decreased, regardless of whether the person registered online or not. Use this to add a cash or check donation after adding the donor to the Senders tab of the Organization, or to record a cash or check payment from a member (Goer) of the Organization. Option 3, Add Mission Trip Support, is available only for online registrations flagged as Mission Trip . A person has been manually added to an organization, instead of registering online. Or the person registered and selected option that did not require a fee, and now needs to change that and pay a fee. You need to set their initial fee and then record a cash or check payment. Or set their initial fee and email them a paylink. After you add the person to the org, click the green Transaction button and select Add Transaction . Enter the Total Fee amount (do not use punctuation). If the person is also making a payment, enter the Payment amount. Enter a Description such as the check number or that the person paid in cash. Click the blue Add Transaction button. Then either click Close to close the dialog box, or click Continue to return to the Member Dialog to view the new balance. The Description entered when adding a transaction, will display only on the Transactions Log when you click the small ‘’i’’ in the blue circle (for more information) on the left of the page beside the ID column. Also, you can right-click on the paylink (assuming there is still a balance), copy it and paste it into an email that to the person, so they can make the payment online. A person who registered and paid their deposit online, is now making a cash or check payment toward their total fee, and you need to record the payment. The Balance Due prior to making the payment will display. Or, if the person has not made any payments yet, the Total Fee will display. Enter the Payment amount and a Description such as “cash” or the check number. The cost of the event has changed after someone has already registered. Now you need to increase or decrease the person’s balance. The fee may increase or decrease for mission trips or other trips or camps due to the fact that airline tickets and/or lodging prices will vary based on the number of people participating. Therefore, the church may get a better price because more people have registered than they anticipated. Of course, it could go the other way, too; and the price could go up. This same procedure can be used to reduce the balance in order to give someone a scholarship or discount for all or part of the balance. Click the green Transaction button and select Make Fee Adjustment . 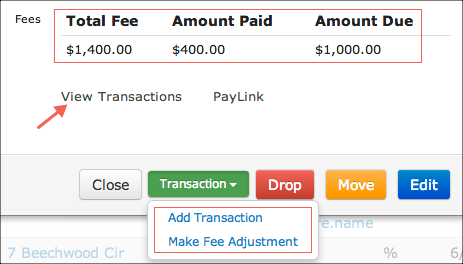 To increase the Balance (the fee has gone up), enter a negative number in the Payment field. Ex. Price increased by $200, enter -200 as the Payment. To decrease the Balance (the fee has gone down), enter a positive number in the Payment field. Ex. Price reduced by $150, enter 150 as the Payment. For scholarships, enter the amount of the scholarship as a positive number. For these types of transactions, we recommend entering a short description in order to document the reason for the change. Click the Add Transaction button. If the person wants to make an online payment, right click where you paylink in the member dialog, copy it and paste it into an email. After adding a transaction, you may want to look at the transactions for that person. Click the View Transactions link that will take you to the Transactions Log for that person’s transactions for that organization. If the cost of the trip needs to be changed (either increased or decreased) for everyone that is already enrolled, you can do that for everyone with a single Transaction. The amount and reason for the adjustment must be the same for everyone when you use this method. You can also use the checkboxes and the filter, if you do not need to make the adjustment for all members. Go to the Members tab on the organization and select the Update Members option from the drop down menu beside the name of the tab. Proceed as in Step 2 above in Use Case 3a, using either a positive number (with no punctuation) to decrease the cost, or a negative number (using a minus sign) to increase the cost. Be sure to include the reason for the change in the description. Click the blue Add Transaction button and close the dialog once the process is complete. If a person registers online and the options they choose do not result in a fee, but later they want to make a change which will give them a balance due, you will need to change their total fee from zero to whatever the cost is. Example: If someone registers for a luncheon which is free for him, but has a fee if he brings his spouse. When he registers, he does not select the option to include his spouse, so his fee is zero. Later, he decides to bring his spouse, and wants to make a payment. Go the person’s Member Dialog and click the green Transaction > Make Fee Adjustment button. Enter the total amount the person owes as a negative number. This will increase the balance from zero to whatever you enter. You can enter a description if you’d like. Press the blue Add Transaction button. This will now give the person a balance due and will create a paylink. If the person wants to pay the amount online, copy the paylink and email it to him. If he wants to pay with cash or check, select the green Transaction > Add Transaction button and enter a positve number in the payment field. Enter the check number or cash in the description. Press the blue Add Transaction button. In this use case, he may not pay the entire amount. If that is the case, he can use the paylink later to make subsequent payments toward the balance.